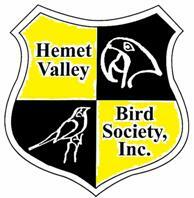 Hemet Valley Bird Society, Inc.
Like Birds? Got Birds? Want Birds? Then we've got the club for you! You are cordially invited to join us the first Saturday of the month. (second Saturday if it is a holiday weekend). Always a casual atmosphere. Visitors and families with children are welcome. Special free raffle for children under 16. Bring your pet birds to show off. You don't have to own a bird to come join in the fun. Meetings include a guest/member speaker or another activity, refreshments and raffles. Our members have pet or breeder birds or are just interested in learning more about birds. Past activities include an ice cream social, Birdie Bingo, show-n-tell and movies. We've had speakers on a variety of subjects including bird care and health, aviaries, bird farms, owls and raptors. The mission of this club is to promote, encourage and develop proper breeding and care of birds, and the education of both the general public and the membership. Copyright© 2008 Hemet Valley Bird Society, Inc.